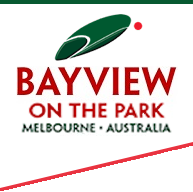 Bayview on the Park is 1.5 km from Port Phillip Bay and only 3 km from the beach at St. Kilda. You can take the tram north to the CBD and the restaurants and bars on Federation Square, or simply walk round the lake to the Melbourne Sports & Aquatic Centre. Albert Park has its own golf course and is also home to the city’s Formula One circuit.